With function keys for zero setting, taring and printing, numeric keys for the entry of manual tare and IDs. Alphanumeric entries possible via multiple key assignment. For indication of weight, multi-lingual operator prompts and calibration dialog. Fast and error-free operation is ensured by a high-contrast alphanumeric LCD for the indication of weight, IDs and operator prompts in combination with an easy-to-use keyboard. 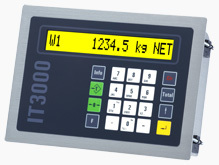 IT3000M connects to one or two scales with up to 16 loadcells and provides a W&M approved resolution of up to 6000d with max. 80% preload. Calibration is possible as single or multiple-range (eg 3x3000d) and as single or multi-interval scale. Interface modules for digital loadcells are available as options. Display of net, tare and gross weight. Operator prompting with entry of up to 20 additional IDs (eg order-No, customer-No, product-No, etc). Prompts and length of entries are configurable. Parts counting and totalizing is also possible. Weighing data can be stored in an internal W&M approved data archive (only for operating modes BASIC, TRUCK and ONLINE). Plug-on modules are used to set IT3000M up for applications of varying complexity. 20-character alphanumeric back-lit LCD, height of characters 14mm, for indication of weight and operator prompts and calibration. Sealed membrane keyboard with tactile feedback, with numeric keys for the input of tare weights and additional information, scale keys for zero setting and taring and function keys. Input of alpha characters via multiple assignment of numeric keys. Integrated signal amplifier for the connection of one or two scales with up to 16 strain gauge loadcells (AC version) or up to 6 loadcells (DC version), W&M approved resolution of up to 6000d at 80% preload. Internal resolution 524,000d, 50 updates per second, smallest loadcell signal 0.33mV/e. Optional interface modules for digital loadcells (Mettler-Toledo TBrick, K…, MTX, Flintec RC3D, HBM C16i). Internal event log for scale errors. Setup as single or multiple-range scale with 1, 2 or 3 ranges or as multi-interval scale. Calibration with test weights or through entry of rated output of loadcell(s), option for the linearization of the load curve. Clear operator prompts for all steps of calibration sequence. Transmission of all calibration data to/from PC with printout. Transmission of all entered IDs, date, time and weight after each weighing cycle, data storage on the PC’s harddisk. Internal W&M approved data archive for the storage of the last 120,000 weighings. Display and printout for verification over selectable period of time. Powerfail-safe storage of date and time. The print layout for labels or forms is fully configurable. Printout of weights, totals, date, time, stored texts, entered IDs and calculated values. Reading of weight, taring, zero setting and other functions can be remotely controlled from a PC. Weights can be stored in a W&M approved data archive in the IT3000M or on the PC’s harddisk for verification. Data transmission is possible through serial interface or Ethernet LAN. With an optional input/output module two weight thresholds can be monitored, eg for max. or min. values. Start of weighing cycle and taring is possible from external switches. Alternatively the inputs and outputs can be used for a filling sequence with start/stop/interrupt and two-speed cut-off. PC interface selectable Ethernet, RS232 or RS422, configurable as data transmission after each weighing cycle or on request. Remote diagnosis is possible via internet. Printer interface selectable RS232 or RS422, for the connection of a form or ticket printer, printout configurable with PC tool RTC CONFIGURATOR. Interface for remote display, selectable RS232 or RS422, several protocols for remote displays can be configured. 2 digital inputs and 2 digital outputs, optoisolated, 24VDC, outputs for setpoint monitoring or simple filling applications, inputs for start of weighing and taring or start/stop of filling. 0-20mA, 4-20mA, 0-10V, 2-10V, 32,000 divisions, for analog output of weight. Recording of weighing data on PC\\\’s harddisk, providing long-time storage. PC tool for the calibration of the scale and the configuration of operating sequence and print format. for remote diagnostics via Ethernet/Internet. Ethernet interface cable With RJ45 connector, 5m or 10m. Transparent plastic cover to protect display and keyboard. – 10°C to + 40°C, 95% relative humidity, non-condensing.